Situated on 18 acres with nearly 1,900 feet of river frontage. Ferry service operates seven days a week, 52 weeks a year on a continuous basis from Dorena, Missouri in Southeastern Mississippi County to Hickman, Kentucky – a 15-minute trip. Service is capable of carrying up to 12 regular-sized vehicles as well as 18-wheelers and large farm equipment. 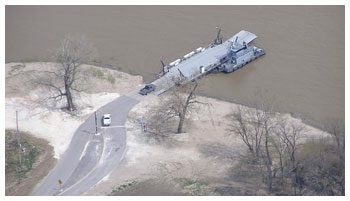 Location allows year-round access for barge operators as the northern-most ice-free area on the Mississippi River. Potable water via a two-inch water line from the Mississippi County Water District available.